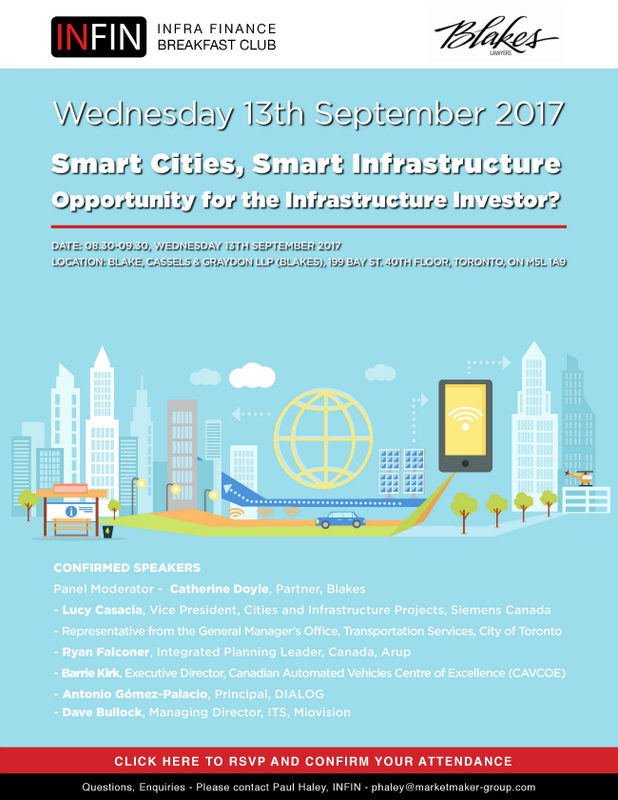 INFIN Canada: Smart Cities, Smart Infrastructure – Opportunity for the Infrastructure Investor? September’s INFIN Canada meeting will focus on ‘Smart Infrastructure’ – What do we mean when we refer to ‘Smart Infrastructure’ and what potential investment opportunities are there for infrastructure investors over the next several years? The session will focus on defining exactly what is ‘Smart Infrastructure’ and examine how cities are adapting to shifts in urban mobility and changes in cities’ populations, the potential for autonomous vehicles (AV), highway/ street investments needed to enable AV, debate over future vehicle ownership, future use of transit systems, urban design and smart buildings, data science and use of transportation data to facilitate the move to connected and autonomous vehicles as well as smart meters, energy grids and generation/ storage, broadband/ fibre optic.